HILLSBORO, OR - Nine new electric vehicle charging stations were recently installed in Hillsboro Oregon. This brings the city's total number of stations to 25. Hillsboro now has more EV charging stations than any other city in the state. For comparison, the city only has 10 gas stations. 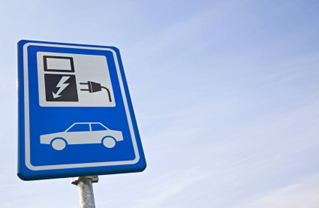 Drivers with plug-in vehicles can charge up at these Coulomb and Blink units for free. A membership card is needed for access. See blinknetwork.com and chargepoint.net for access cards. 10 Interesting New Facts about the Nissan Leaf | Electric Car Conversion Blog: "environmentalists, EV advocates and tech-savvy individuals"
In most places, there are few if any charging stations. Plug-in cars like the Leaf and Volt are currently rolling off of assembly lines and into the hands of owners. Inevitably, there will be a case where you want to plug in your vehicle, but someone else is already there. If you really need to charge, is it OK to unplug them? If they have the charging protocol card, then at a glance you know how long they need to charge. If you need them to move their car for access, there might even be a contact phone number. EV drivers are part of a community. A community that is working together to make the world a little bit better. You can be part of that community by sharing the limited infrastructure that we currently have. The card below helps to facilitate charging station sharing. If you drive a plug-in vehicle, print this out, grab a paperclip to mark the time and drop it on your dash when you are charging in public.